This beautiful villa conveniently situated in the east coast of Rhodes just 300m from the golden sandy beach of Pefkos. The villa is only 3km away from the lively, historic village of Lindos with its imposing castle and a plethora of ancient and medieval monuments. Surrounded by olive trees and a typical Mediterranean garden, Pefkos Melfe Villa is perfect for those seeking a relaxing holiday without making any compromise in terms of comfort and amenities. Lay back in our spacious verandas, watch the sea and let the breeze and the bright blue sky take everything away. A holiday experience you’ll never forget. I am the owner of Central Pefkos villas, I born in Rhodes- Lindos and I live all my life in Lindos. I have 3 wonderful boys. I look forward to meet all of you! The living room has air-conditioning and is equipped with comfortable sofas, a table and a sofa bed. There is also a 32" LCD HDTV set with satellite tv and DVD,mp3 player and free Wireless Internet access. Notes on accommodation: Air-conditioning throughout, free of charge. Baby cots available at no extra cost. Free cleaning every day eand linen changing service twice a week. Extra bed sheets and towels, beach towels available in closets, sun beds to the garden.Shared pool. Food delivery and catering service. Free wireless high speed internet access. Private parking space, transfer arrange with extra pay and help with rent a car. Massage service, baby sitting service. Outside: The villas is surrounded by an olive grove and a beautiful Mediterranean garden There is a wide veranda with great sea and garden view. Is equipped with loungers, tables and canvas parasols, umbrellas. There is a snack bar pool opposite from the house that you can have your breakfast, lunch and snacks. Utility Room: There is a utility room under the stairway with all cleaning equipment, iron/ironing board, sewing box, first aid kit and storage space, pharmacy. Cleaning / Towels / Linen / Maid service: All linen and towels is supplied and also beach towels. Extra linen and towels available in closets, free of charge. Cleaning every day except Sundays and linen, towels changing service is twice a week, but you can contact us if you wish to make a different arrangement. Stunning property with the perfect location. Eleni is really hospitable and provided everything we needed to make our stay amazing. The town of Pefkos is stunning with everything within walking distance from the Villa. Will definitely go back. The pool is fab and we couldn't of asked for more. Thank you Eleni and see you next year. 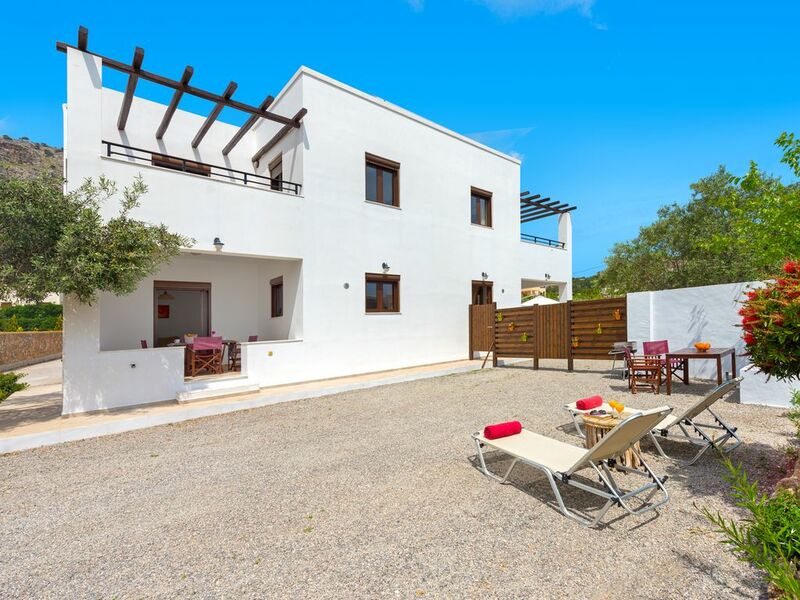 Villa Melfe is not only the perfect villa, it is als perfectly situated - two minute walk from supermarket / bars /restaurants. Cleaned every day, the villa seems brand new, with all the mod - cons you could need. A welcome pack / leaving gift completes the stay. Is a place for your perfect vacations! San Thomas beach just 300m from the villa. Lee beach only 500m from the villa. Nearest airport 45km from the villa. Nearest port 50km from the villa. Car hire recommended. Arrange transfer from-to the airport. Lindos historic village only 3km. In Pefkos you can find all services and amenities you may need, such as banks with cash dispensers, supermarkets, travel agencies, restaurants, bars, cafés etc on your doorstep. Excursions boats leave the port of the nearby village of Lindos for day cruises to Rhodes Town, the island of Symi and the Turkish coast. You can rent an ultra light aircraft for an unforgettable flight over the ancient Acropolis. Tens of organised beaches with water sports and quieter, secluded coves are within walking distance or a few minutes drive away. Booking Notes: To book a villa the 25% of the total cost is required with the balance due 6 weeks before the arrival or payment at the arrival. Payments can be made by bank transfer or by paypal transfer. Cancellation: 6 weeks or more prior to departure deposit only / 3-6 weeks prior to departure50% of rate / 0-3 weeks prior to departure 75% of rate / In case of no-show 100%. Changeover Day: Flexible changeover day and time. Please advice us on expected arrival time if possible, quoting your flight number. Notes on prices: All prices include every day cleaning(no Sundays), twice a week linen changing service, free use A/C and Wifi Internet. Extra linen and towels available in closets, WiFi, free of charge. Free baby cots available on request and all the facilities for babies. Early booking with discound!